If you’re in Singapore on business, you’ll be welcomed to the private check-in to the Traders Club by a special guest relations officer. This part of the hotel, on the 17th floor, is dedicated to the needs of those working away from home. It includes a special lounge with a number of exclusive services and all the business support you might need. A Business Centre is your office away from home with all the technology and privacy you need to keep working efficiently. The Traders Club rooms are on the higher floors of the hotel with panoramic views of Singapore. There are also full meeting facilities, with flexible rooms that accommodate from 16 to 300 people. For accommodation, you have a choice of superior or deluxe rooms, as well as two levels of suite. Whatever you choose, you’ll find more than ample space and the features you’d expect from a modern international hotel. Of course, all travellers will want to unwind, relax and be pampered. Up on the roof, you’ll find the magnificent 30 metre outdoor pool, and a separate one for children. All very refreshing. Head for the Health Spa for a spot of pampering with a massage or a choice of therapies. The well-equipped gym is open around the clock and there’s a steam room, sauna, whirlpool and chill-out lounge to leave you feeling thoroughly de-stressed. A hair salon and nail bar will add the final touches. Snacking, dining, refreshments and socialising is catered for with a choice of five restaurants, lounges and bars. You can eat everything from fresh Italian pizza to local specialities like Chilli Crab or Lobster Behoon. With such a pleasant climate, there’s plenty of opportunity to eat al fresco too. This is the kind of hotel where everything is taken care of. Whether it’s foreign exchange, fresh flowers, limo service, hire cars, parking, or just getting your shoes shined, it’ll be sorted with no fuss or bother. All this, and a prime location too. 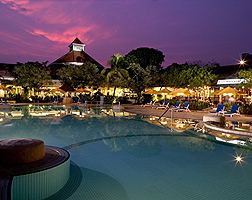 The Traders is an all-round achiever with top marks for business and leisure travellers alike.